Titanium was the first contemporary metal on the market. Titanium is known for its extremely light weight. Our rings are made from aircraft grade five titanium. This high grade of titanium is the most durable grade available. It has a dark gray color similar to tungsten. Titanium is hypoallergenic and biocompatible. 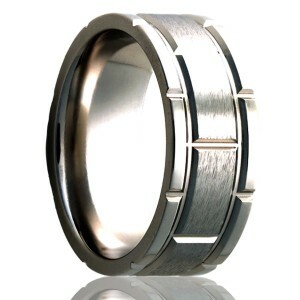 Titanium is a great choice for someone who is looking for a light weight ring and something easy on the pocketbook. Titanium, though hard, is a great material for customization. Titanium can be cut off with diamond-tip ring cutter. Titanium is commonly used in aerospace and sporting goods.